Climate change is stirring life in the Arctic Ocean as thinning sea ice lets in more sunlight, allowing microscopic algae to bloom in the inhospitable region around the North Pole, scientists said. The micro-algae may now be able to grow under the ice across almost 30 percent of the Arctic Ocean at the peak of the brief summer in July, up from about 5 percent 30 years ago, they wrote. Blooms may become even more widespread. The crew of the U.S. Coast Guard Cutter Healy, in the midst of their ICESCAPE mission, retrieves supplies for some mid-mission fixes dropped by parachute from a C-130 in the Arctic Ocean in this July 12, 2011 photo. 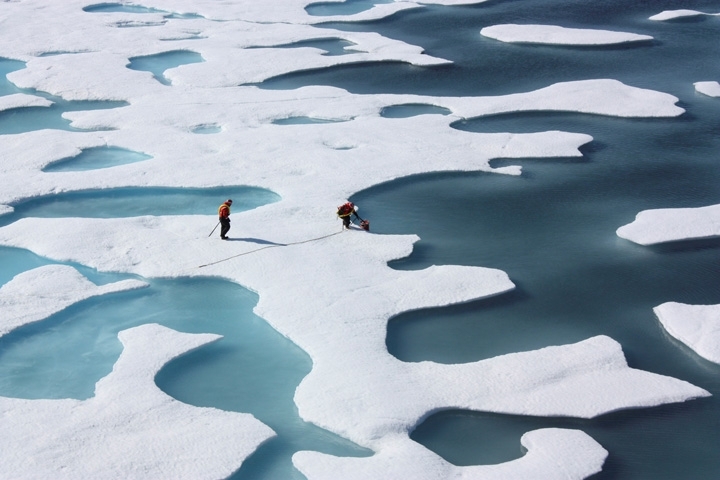 “Recent climate change may have markedly altered the ecology of the Arctic Ocean,” wrote scientists in the United States and Britain led by Christopher Horvat of Harvard University. The first massive under-ice bloom of algae was seen in 2011 in the Chukchi Sea north of the Bering Strait separating Alaska and Russia, a region until then thought too dark for photosynthesis. The scientists, writing in the open-access journal Science Advances, based their estimates on mathematical models of the thinning ice and ponds of melt water on the ice surface that help ever more sunlight penetrate into the frigid waters below. The average thickness of Arctic sea ice fell to 1.89 meters (6.2 ft) in 2008 from 3.64 meters in 1980, according to another study. Sub-ice algae seem to become dormant in winter, when the sun disappears for months, and are revived in spring. Horvat told Reuters it was unclear how the growth might have knock-on effects on the Arctic food chain, perhaps drawing more fish northwards. “Very few of these blooms have been observed,” he wrote in an e-mail. The new light adds to uncertainties about the economic future of the region that is warming at about double the average rate for the Earth as a whole. Almost all governments blame this trend mainly on a build-up of man-made greenhouse gases. U.S. President Donald Trump, however, has sometimes called man-made warming a hoax and signed an order on Tuesday to undo climate change regulations issued by former President Barack Obama. Governments of nations around the Arctic Ocean, including the United States, have been working on rules for managing potential future fish stocks in the central Arctic Ocean as the ice shrinks and thins. They last met in mid-March in Iceland.